House Speaker Nancy Pelosi just endorsed net neutrality. But The Money Party is busy buying votes. 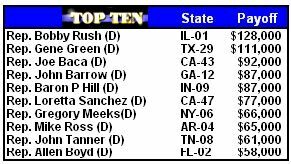 Here's a Top Ten list of the biggest rake-offs by the 74 Democrats. They had a total take of $2.8 million with an average of $37,000 a piece from industry sources and lobbyists. No telling how many jobs, trips, and other favors were provided. The Money Party is nothing, if not thorough. Why would the major carriers want to control internet traffic by slowing it down or blocking it on occasion? We'll call it the BP syndrome. They're excessively cheap. In the good old days, the original internet (Telenet's public data network) built network capacity based on "the Mother's Day" principle. The network was built to tolerate peak loads with the same level of service it normally provided, which was excellent. Since the cable and telephone companies bought up the original network providers, a race to the bottom has begun in terms of quality of service. Instead of maximum quality at all times, the new motto is, "let them eat crap." If the network is too busy, just cut off the public in favor of the higher paying corporate and government customers. When does the advertised internet speed ever match actual throughput? Test it yourself. We have a decrepit business and government elite. They're not even smart enough to figure out that the internet is the new third rail of politics. Let them know that the old bait-and-switch no longer works. We're glad that Speaker Pelosi endorses net neutrality but we expect near universal support from the party. This article may be reprinted in whole or in part with attribution of authorship and a link to this article.